Rep. Bradley Byrne, a Republican, formally announced his candidacy for the Senate. Feb. 25, 2019 — One of the critical 2020 US Senate contests is beginning to take shape. Over the past few days, Alabama Rep. Bradley Byrne (R-Mobile) formally announced his statewide candidacy with the goal of opposing Democratic Sen. Doug Jones, who won the controversial 2017 special election that attracted national attention. The Jones victory, defeating beleaguered Republican Roy Moore, a former state Supreme Court Chief Justice, represented the first time a Democrat won an Alabama statewide federal election since incumbent Sen. Howell Heflin secured his final term in 1990. Prior to that, Richard Shelby, then a Democratic congressman, unseated Republican Sen. Jeremiah Denton in 1986. Shelby then switched to the Republican Party immediately after the 1994 election. Prior to the Denton victory on the same night that Ronald Reagan was first elected president, no Republican had won an Alabama seat for more than 100 years. The Yellowhammer State Senate race could well be the lynchpin to determining which party will control the chamber after the 2020 election. With the electoral map favoring the Democrats because Republicans must defend 22 of the 34 in-cycle seats, including the Arizona special Senate election, Alabama becomes a virtual “must-win” for the GOP. Dec. 13, 2018 — Reviewing documentation from the 2018 US Senate races, it appears there is at least a tangential correlation between an incumbent senator’s pre-campaign approval rating and the vote percentage garnered on Election Day. 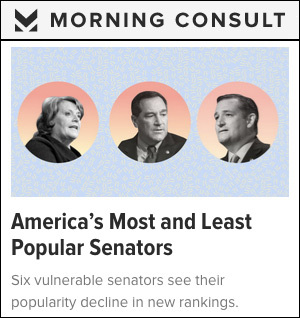 The Morning Consult public affairs firm routinely surveys senators and governors to produce approval indexes for every member. Their 3rd Quarter 2018 sampling was publicly released on Oct. 10, one month before the election and just at the beginning of prime time campaigning. Looking at the 32 incumbent senators who were on the ballot in November, the mean average increase from the individual’s approval score to the final vote percentage is 9.6 points when using the Morning Consult favorability index as our constant and the median is nine points. The senator dropping the furthest from approval to vote percentage, down five points, was Maine Sen. Angus King (I), but the number is a bit deceiving. King scored a 58 percent positive approval rating in mid-October, but only received 53 percent in the election. Because the senator is an Independent and the Democrats with whom he caucuses did file their own candidate, the next closest opponent scored 35 percent. Therefore, his political standing still proved strong. On the other end of the spectrum, the senator who improved the most from an upside-down favorability index rating to the vote was New Jersey Sen. Bob Menendez (D). While his October index was a poor 31:46 percent favorable to unfavorable, the worst by far among the 32 senators standing for re-election, he was successfully re-elected, 54-43 percent, over retired pharmaceutical company CEO Bob Hugin (R). 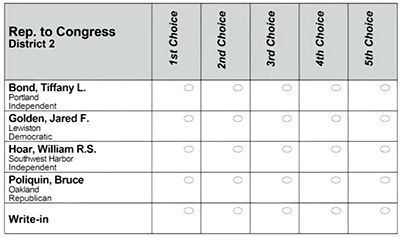 Nov. 15, 2018 — Believing that Maine’s relatively new Ranked Choice Voting system will turn his current plurality re-election victory into a loss, Rep. Bruce Poliquin (R-Oakland/Bangor) and three others are filing a federal lawsuit asking a judge to halt the instant run-off process before post-election counting begins. With just a scant number of absentee votes remaining, Rep. Poliquin leads state Rep. Jared Golden (D-Lewiston) by an unofficial 1,910 votes and it is clear that he will finish the final count with a lead. The congressman’s vote total, however, is well below 50 percent meaning the instant run-off will occur. With two leftward Independent candidates on the ballot attracting just under 24,000 votes, Golden is more likely to gain a substantial majority in the second- or third-ranked choice round, which would likely allow him to pass Poliquin and exceed the 50 percent mark. Thus, we are likely to see a situation where the candidate who placed first in the final general election count will not be awarded the office. Pine Tree State voters adopted the controversial practice in what most observers believe was a reaction to Gov. Paul LePage (R) winning two statewide elections with less than majority support. In his first electoral contest (2010), LePage, then the mayor of Waterville, was elected governor in a three-way race with only 38 percent of the vote. 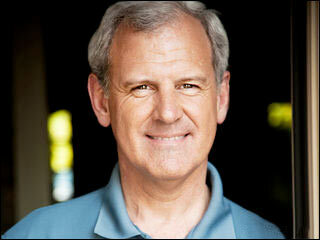 Four years later, he was re-elected with 48 percent in another three-way campaign. Independents are often credible candidates in Maine political campaigns and sometimes win those races as in the case of Sen. Angus King (I), for example. March 17, 2017 — As we approach the end of first quarter 2017, we see political maneuvering beginning to occur in many in-cycle US Senate states. Despite what columnists and news reporters are already saying about the Republicans potentially sustaining big mid-term losses in 2018, the Democrats have only one legitimate Senate target: Sen. Dean Heller (R-NV). Unfortunately for them, Democrats must defend 25 of the 34 in-cycle seats (the latter number includes the Alabama special election), and this political fundamental is likely the key reason Republicans will hold the majority irrespective of what the political climate may be like at election time. Arguably, seven of the nine in-cycle GOP seats are located in some of the strongest Republican states in the nation. Today we take a look at the states alphabetically from Alabama through Maryland. • Alabama: Appointed Sen. Luther Strange (R) has over a year to solidify himself politically before standing for election. He may well receive a Republican primary challenge because of the circumstances under which he was appointed to succeed Attorney General Jeff Sessions. Sen. Strange, while the Alabama attorney general, was conducting an investigation into Gov. Robert Bentley (R), which was obviously stalled when the appointment was made. So far, no one has announced against Sen. Strange, but state Senate President Del Marsh (R) is a possible candidate. Jan. 31, 2017 — Senators Dianne Feinstein (D-CA) and Orrin Hatch (R-UT), two of the Senate’s most elderly members, were at the top of the potential retirement list in 2018. But, as we mentioned in our updates during the preceding 10 days, both are now sending re-election signals. California: Sen. Feinstein stated during a radio interview within the past few days that she is “leaning” toward seeking re-election, feeling that her age during the next campaign (85) will not be a particular detriment either to her political ability or in representing her constituents. She stopped short, however, of making a formal campaign announcement. Delaware: Sen. Tom Carper (D) said in early December that he has not yet decided whether he will seek a fourth term in 2018. The senator has been in elective office for 40 consecutive years, and will be 72 at the time of the next election. Florida: Sen. Bill Nelson (D) was also thought to be a retirement possibility, considering that he will be 76 years of age in 2018, and will complete 30 years of congressional service in that same year. Repeatedly, however, Sen. Nelson has said that he will seek a fourth term next year. Indiana: In what promises to be a hotly contested campaign, Sen. Joe Donnelly (D) announced his re-election intention in January, and is beginning to hire political staff. Identifying and analyzing emerging trends in campaigns and elections.